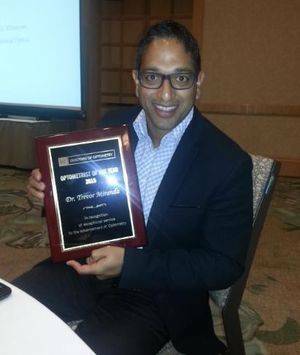 The British Columbia Association of Optometrists named Dr. Trevor Miranda Optometrist of the Year for 2015. This prestigious honour recognizes Dr. Miranda’s commitment to providing every patient with exceptional care while mentoring optometrists across Canada. Dr. Miranda is dedicated to providing outstanding eye care at his four practices in the Cowichan Valley: Cobble Hill, Duncan, Lake Cowichan, and Chemainus.